David Gordon Green was an indie favorite until he turned in 3 poorly received studio comedies (Pineapple Express, Your Highness, and The Sitter), and now he seems to be returning to his roots. Last year's Prince Avalanche and this years Joe are a welcome return to his indie drama form. 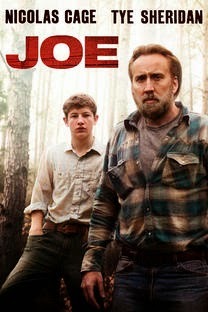 I'm not normally a fan of Nicolas Cage, although I do think he can be good, he just usually isn't. Here, he is great. It's possibly his best performance. He stands head and shoulders above the non-actors he works with in many of his scenes, and yet plays very nicely alongside rising star Tye Sheridan, who was very good in last years Mud , despite being overshadowed by Matthew McConaughey. Joe actually feels quite a bit like Mud. Both films involve an ex-con trying to lay low and get on with life. They both end up befriending, and becoming a fatherly figure to Tye Sheridan's character. Both also take place in the dark and dirty south. I say dark and dirty, because this is not a pleasant town, and the film certainly has a dark edge to it. Gary (Tye Sheridan) lives in an old rundown shack with his family, all of whom live in a constant state of fear due to their abusive, alcoholic father Wade (Gary Poulter). When Gary goes to Joe looking for work, Joe takes him in and even allows Gary's father to try his hand at the work. The job is deforestation by hacking at trees with an axe that spews poison into the tree in order to kill it. While Gary fits in well enough with the crew, his father is too lazy and out of shape to keep up. Instead, Gary's father just beats him up and take his hard earned money away so he can keep buying alcohol. Joe finds himself between a rock and hard place when Willie (Ronnie Gene Blevins), an old enemy, shows up. He threatens not just Joe, but Gary as well simply because he knows Joe. Being a former convict, Joe knows he's being watched constantly by the cops. He is well aware that he's on very thin ice, nevertheless he has to find a way to protect the kid from both Willie and Gary's own abusive father. It's a film of light and dark, good and bad, and all are present in every character. It has a feeling of real life, which in a way grants it an even darker edge. It helps that a majority of the cast in non-professional actors, and yet that shows the brilliance of the direction by David Gordon Green. Few directors can get such natural performances out of a cast of so many non-actors. Gary Poulter is brilliant and haunting as the abusive father, and Joe's crew is made up of entirely non-actors that all play their minor roles extremely well. While the film takes its time in setting up the characters, the locale, and scenario, it never ceases to feel intense and atmospheric. The music, the editing, and the acting all lend to the feeling of imminent dread. Gordon Green also masterfully teeters the tone between slice of life and violent melodrama. Nicolas Cage is brilliant as a man constantly on the verge of a breakdown. He is clearly struggling to maintain peace and order in his life. As things become more complicated with Gary around we see him struggle to maintain himself despite his inner turmoil. He is caught between the cops and two evil men. The big struggle Joe is concerned with is whether or not doing something bad can be the right thing.